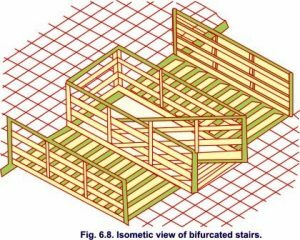 Learn Types of stairs : Stair, Straight flight stairs.Dog legged stairs.Open newel stairs.Quarter turn stairs.Bifurcated stairs.Geometrical stairs.Spiral stairs. It is the simplest type of stairs, and con­sists of one or in some cases two flights running in one direction only. These stairs are used, when the space available is narrow and long. 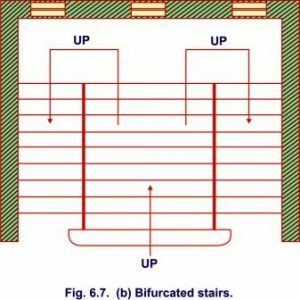 It is a very common and popular type of stairs and is used in public as well as residential buildings. It consists of two flights running in opposite directions, separated by a half space landing or a quarter space landing and a set of winders. The dog-legged stair is so called because the bent of the stairs is similar to the dog’s leg. When the space available is equal to twice the width of the stairs, dog legged stair is used. It is similar to the dog legged, stair except that in this case the two flights are separated by an open well. The open newel stair is a convenient type of stair and is generally used in public buildings. The width of the open well depends upon the space available but the varies from 60 cm to 120 cm. 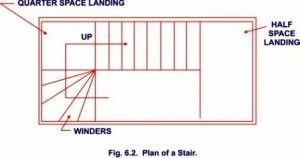 The two flights ate either separated by a half space lending’ or two quarter space landings with a set of steps as shown in Fig. 6’5. The open well between the two flights can be used for fixing a ‘Lift’. In this type of stair, the two flights run at right angles to each other and are separated by a quarter space larding. 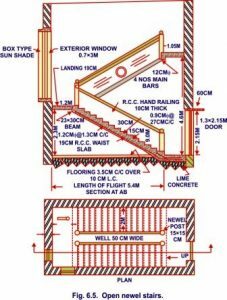 the stairs are generally provided when wall support is on one side only, or when in a huge appartment such as an entrance hall, stairs are to be provided. These stairs are commonly used in public buildings. In this type of stairs, the bottom flight is wider and is bifurcated into two narrower flights at the landing. The bifurcated stairs may be of two types, viz. Quarter turn and half turn. 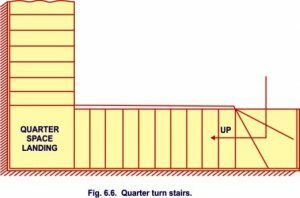 In the quarter turn type, the upper the lower flights run at right angle whereas in the half turn bifurcated stairs, the sets of flights go in opposite directions as in a quarter turn stair and dog-legged stair respectively. 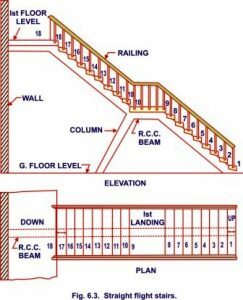 The geometrical stairs are generally used in high class residential buildings. 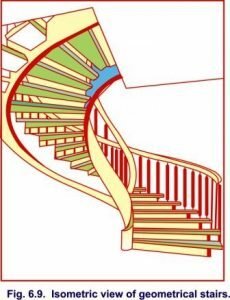 The stair is in the form of some curve, having all the steps as winders, radiating from the-centre of curvature of the curve. 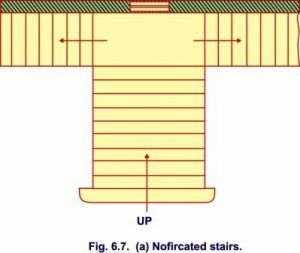 The hand rail of a geometrical stair, continues without interruption and without any angular turn-Considerable skill is required for fie designing and construction of a geometrical stair. The minimum width of this stair has been, fixed at 1.75 m.
These stairs are generally constructed either of cast iron or R.C.C. The steps which are all winders, radiate from a central vertical shaft and are attached to it. The steps are generally pre-cast and are fitted to the central pillar. These stairs are used on the back-side of a building for emergency use as well as in those places where the space is limited.